As these were mentioned on George Shier's Wacky Comics blog earlier I thought I'd dig them out to show here. 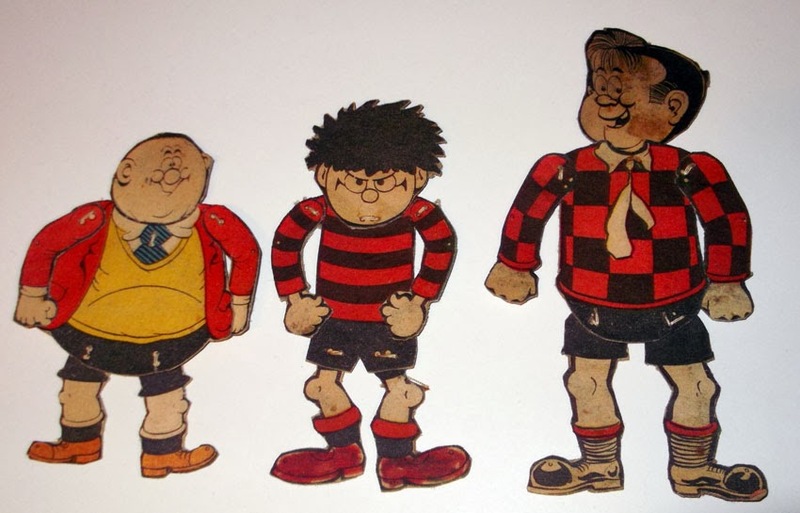 From Autumn 1967 through most of 1968 The Beano featured a different character every week in the form of a puppet to cut out. The feature appeared in the centre pages, taking up roughly a quarter of the second Bash Street Kids page. 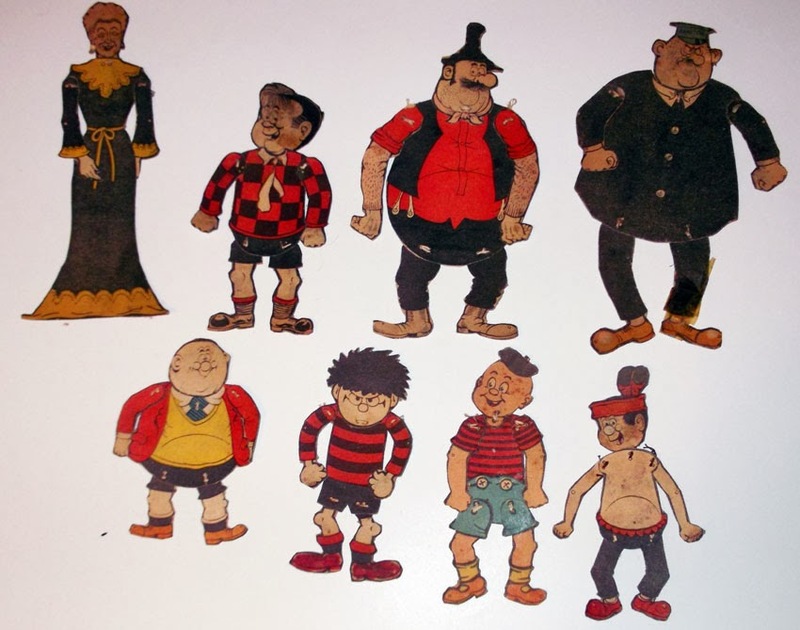 I vividly remember that Wilfrid was the first one presented, and I think he was followed in subsequent weeks by the rest of The Bash Street Kids before it moved on to feature other Beano characters. 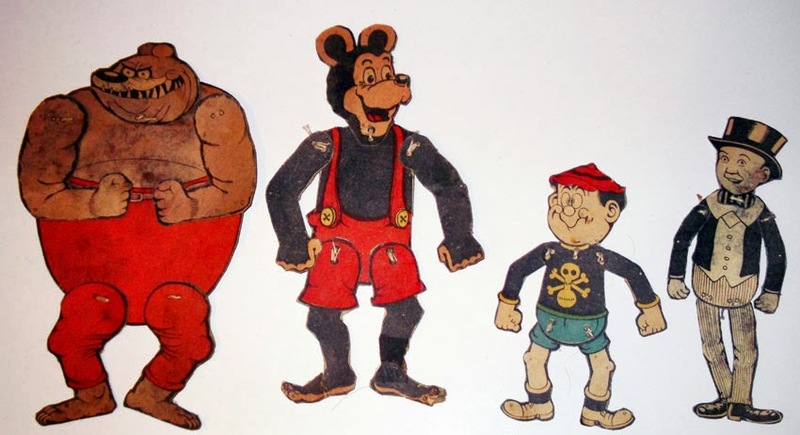 As you can see they had a flexible attitude towards keeping the characters the correct proportion to each other. Puppet Fatty is smaller than Dennis! I'm pretty sure I cut out every one so I think they're all shown here. (That said, I seem to remember a General Jumbo one too but that appears to be missing.) Please forgive the grotty appearance of some of them. Over the years the glue soaked through the flimsy newsprint and turned brown as glue is wont to do. 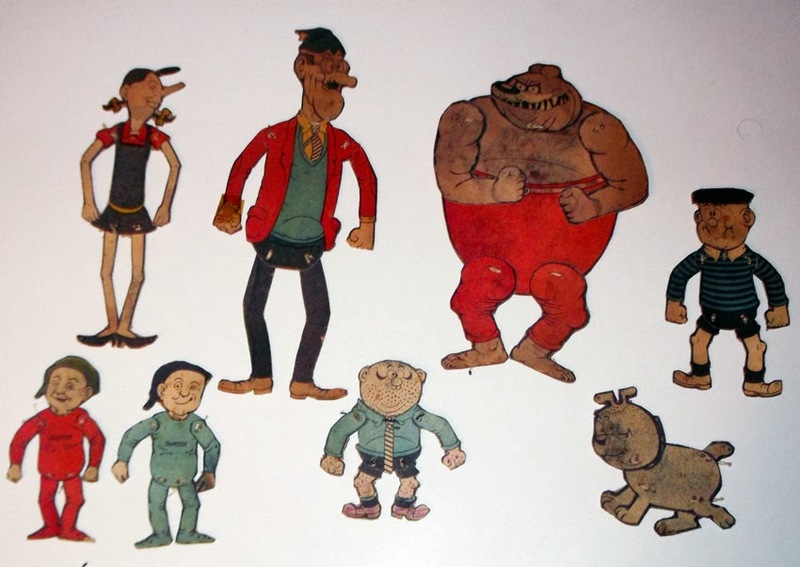 The artwork for the puppets was mainly by David Sutherland, although the Roger the Dodger, Biffo, and Buster ones are by Gordon Bell. 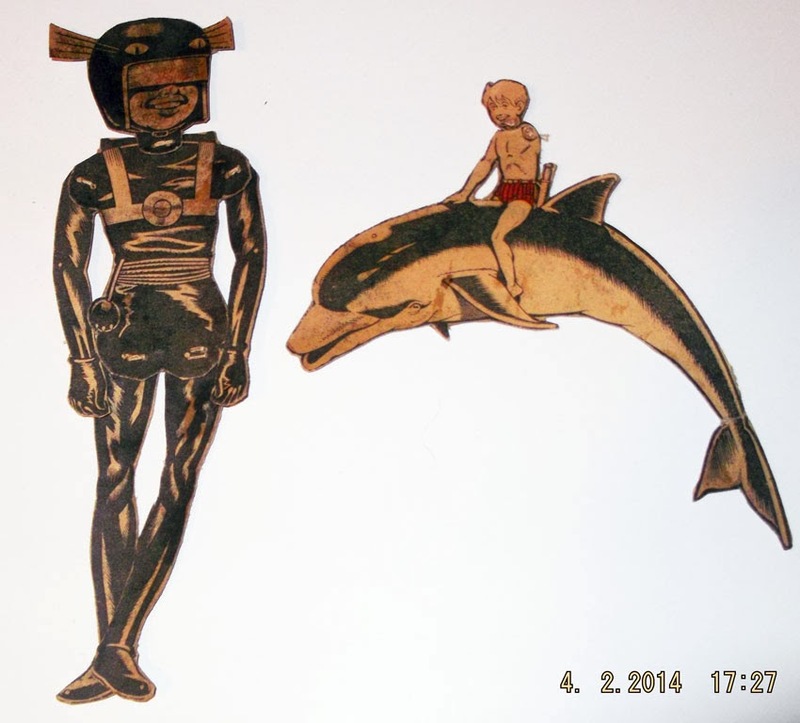 The idea was to connect the limbs and head to the torso with loops of cotton and manipulate them with another length of cotton. I couldn't be bothered with that and preferred the limbs sewn tightly to their joints so I could play with the puppets as sort of flat cardboard action figures. My mum had the job of sewing them together each week but she didn't mind and as a trained tailoress it was a quick task for her. These puppets have been in an old shoebox for years but I found them last year when I was clearing out my mum's house after she'd passed away. 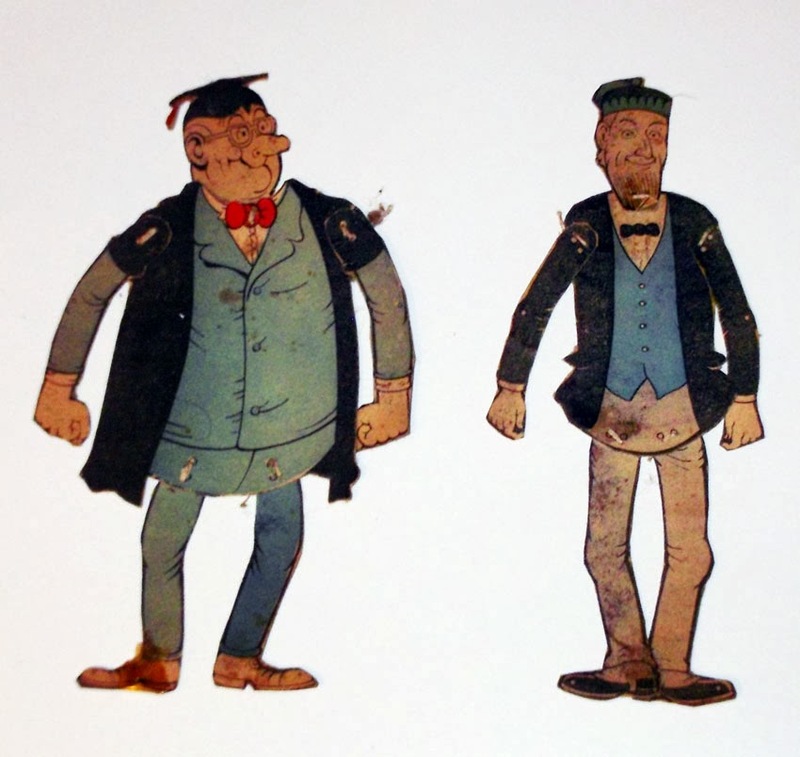 The book The History of The Beano showed some of the puppets as they appeared before thousands of Beano readers took scissors to them. Interestingly, The Beano didn't make a fuss in promoting the puppets. There were no cover lines mentioning them as I recall. They just appeared unannounced one week and became a fixture for months afterwards. Then quietly stopped when all the characters had been exhausted. It was a nice idea, and I remember the anticipation every week of wondering who would be featured next. 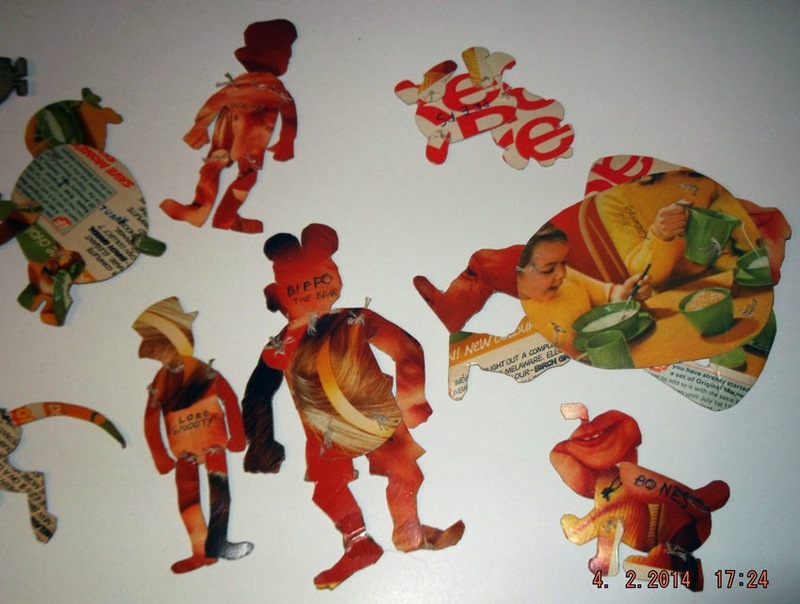 No doubt many readers cut out the puppets just as I did, so the chances of collectors finding undamaged copies from that period must be slim. 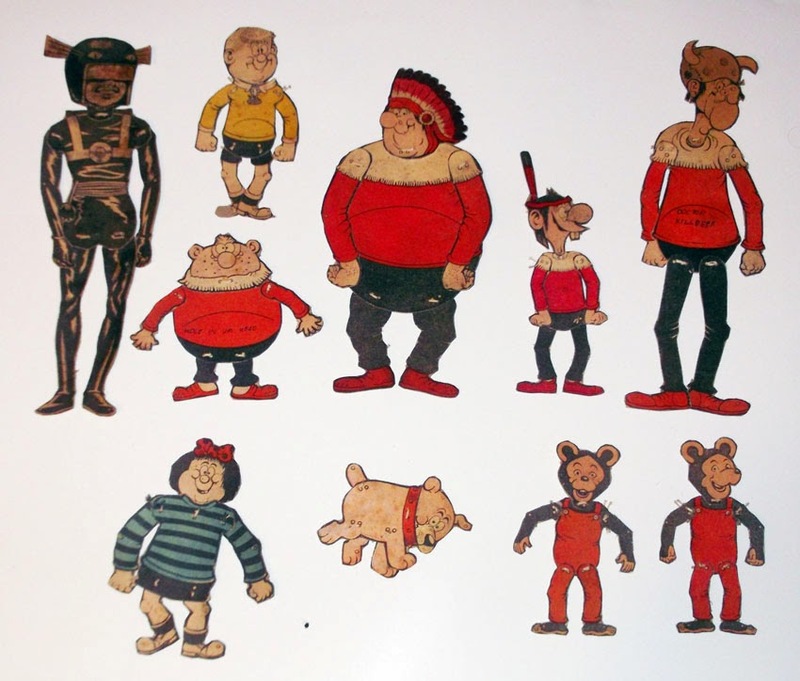 Maybe they should bring them back for todays Beano...a rasher puppet!! Oh I knew where they were Peter. I just hadn't looked at them for a while. Kids today might find them a bit unexciting but it'd be interesting to see if they did react positively to them. Nice, thanks for showing them! 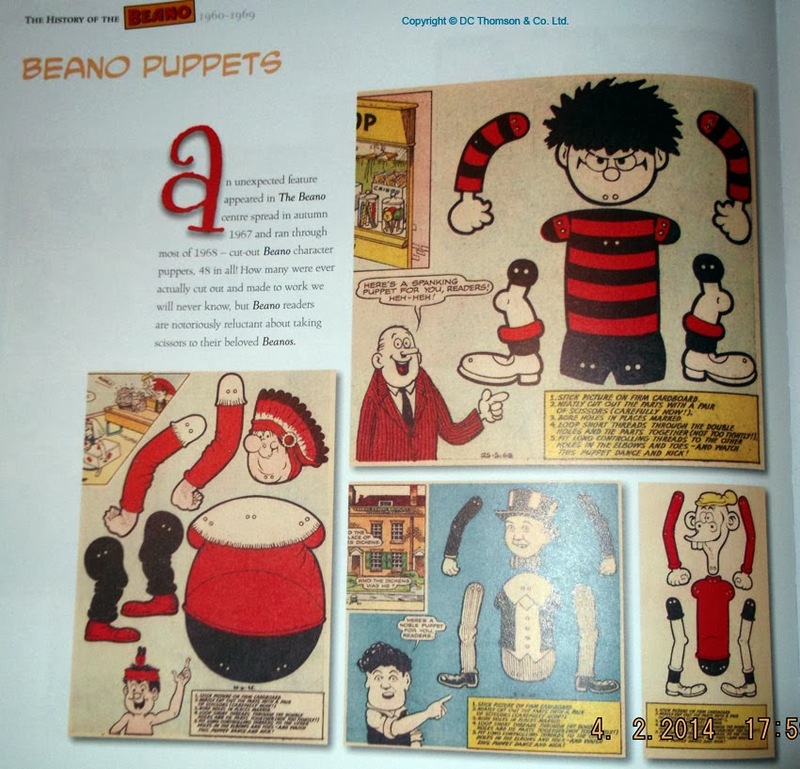 I first found out about the puppets when reading the History of the Beano a few years ago and since then I have collected a complete set of the weeklies with the puppets inside, and as you say, it wasn’t easy finding copies with them intact. The series began in issue No. 1321 (Nov. 11th, 1967) and continued until No. 1367 (Sept 28th, 1968). Billy the Cat falls outside of this period and was in issue No. 1397 (April 26th, 1969). Thanks Irmantas. I know Ray Moore's Beano index listed the issues but I've mislaid it at present. Could you confirm whether or not there was a General Jumbo puppet? If you have time of course. I will check for General Jumbo but I don't remember seeing it in the series. In addition to my previous comment, I can confirm that Biffo and Buster puppets were on the front cover of the Beano No. 1308 (August 12th, 1967), so they also fell outside the period of issues 1321 to 1367. Some were reprinted in the 1970s. I forget where I saw them, possibly on Comics UK, more likely on somebody’s blog discussing birthday issues or something, but it was excerpts from a 1970s Beano which reprinted one of these Kids strips. Thanks for the additional info Andy. I wasn't reading The Beano between 1974 and 1980 so I must have missed the reprints. I kind of remember these. 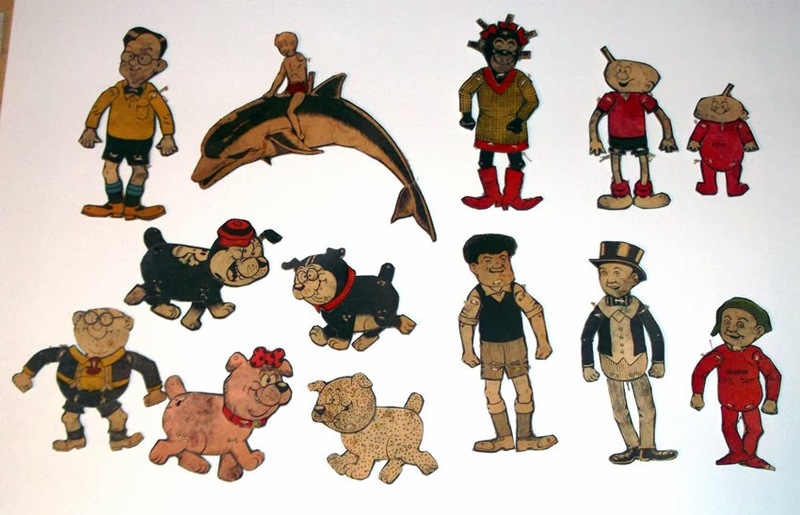 I know I did some finger puppets for Sweeny and Henry Dog in the 80's, and it was because I remembered something being fun many years before, presumably the Beano puppets. Re bringing them back -- they did do something similar not long ago, didn't they, but with plastic figures. Nice to see them all in one place. I have a good number of Beanos from these months with the puppets intact that I picked up for just £30 so they can't be that rare. Good point, Wilbur. Yes, those recent plastic figures basically served the same purpose. They were very nice gifts I thought. interesting that there were three completely different Biffos by two different artists. Also good that, unlike some artists (mostly in America I find, but sometimes in the UK), while they two versions are very different, they are clearly the same character.. some American comics, a lot today, you can often pick up and issue and not recognise any character unless they are labelled. Different art styles but keeping true to the character is a very good mark of a good artist I find. The two smaller Biffo-type bears were Biffo's nephews who appeared in the strip sometimes. ah,.. of course.. Cuddly and Dudley I think.. remins me.. when was the last time Denise, Dennis's very simpler female cousin appeared? 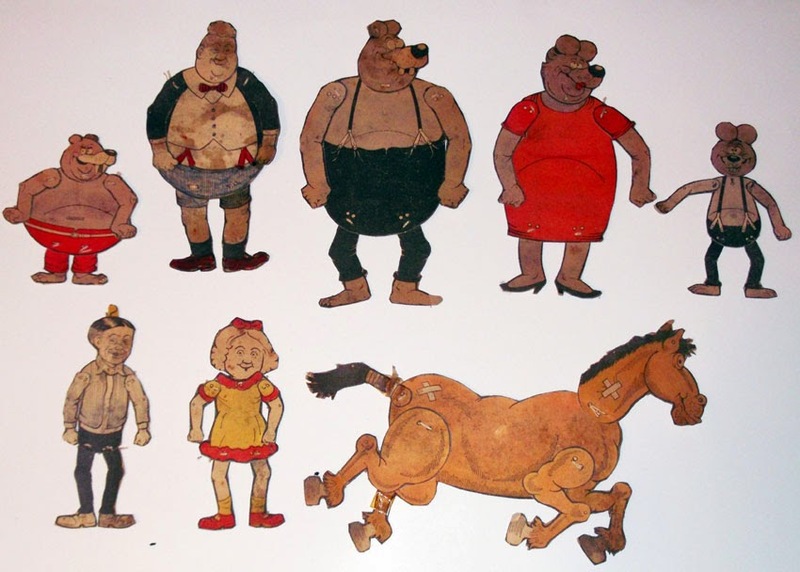 or any of Gnashers Kids, apart from Gnipper.. or Rashers Sister.. a lot of the 'family' characters seam to be little used.. mostly for short spells then forgotten about. Hi Lew. From what I can see all the puppets are present. There was never a General Jumbo. I remember my mum stitching there together for me too. I made my own little puppet theatre out of shoe boxes and to cover my other fascination at the time I made my own puppets featuring characters from DC comics. Many an hour being whiled away devising plots that could encompasss Lord Snooty and his pals and the Legión of Superhéroes! Ray. Thanks Ray. Good to know that I must have the set then. Manic Man, Denise last featured in the mid-1980s as far as I can remember. Rasher's family never returned after his own strip was cancelled. I think it was Gnatasha who had her own strip illustrated by Bill Ritchie, and I think it was in the Beezer. I must confess I either didn't know about Rasher's family or have forgotten them. I don't think they'd suit the direction of the current mini-strips I do but if editorial wanted them back I'd do it of course. 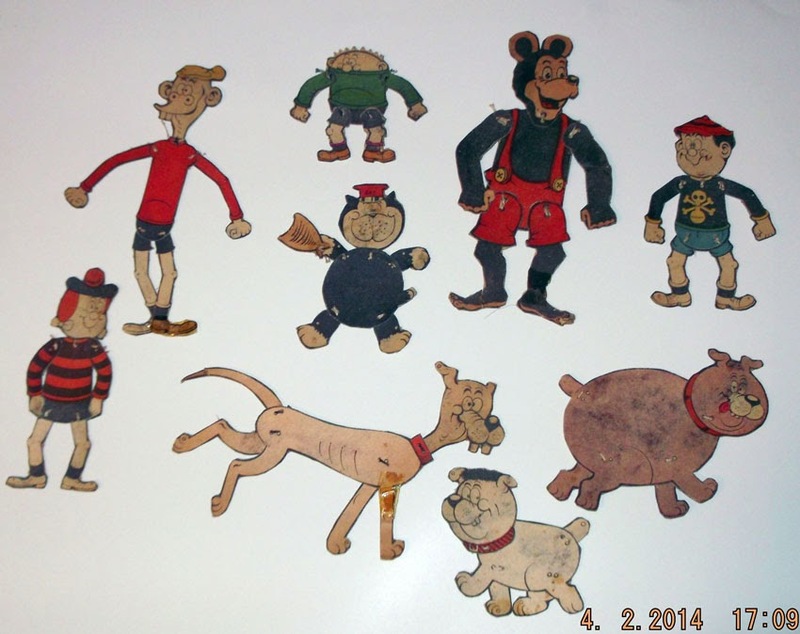 At the moment I'd rather have Rasher on his own, or interacting with Gnasher, The Bash Street Dogs, etc, or dreaming of his piggy version of Earth. They featured in flashbacks to the farm where Rasher lived. Info on Wikipedia re the cast is correct. Hiya Lew, I had a vivid memory flashback when I saw this post. I remember that I badly bodged the job in putting the puppets together when I tried to make them. 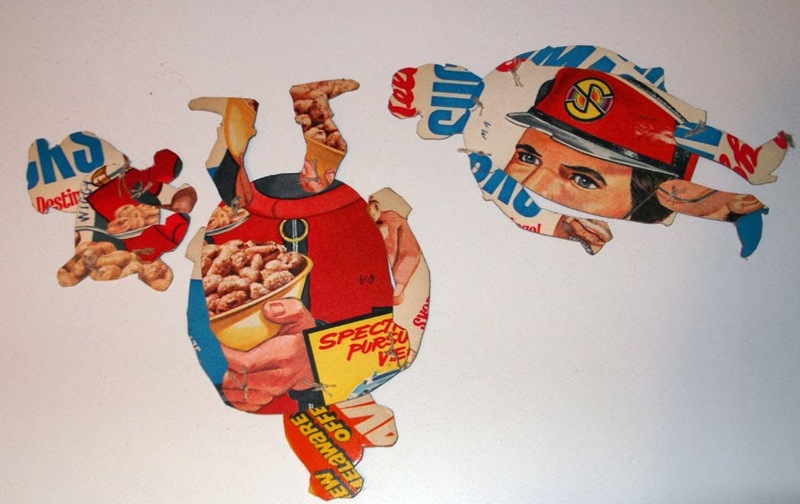 Cut up my Beanos, spilled glue over the kitchen table and made a right old mess. I can safely say that being a 10 year old in 1968 was the low point in my handicrafting life. You had a far superior set of skills back in the day, it's great to see what the puppets were supposed to look like! Incredible that you still have them. 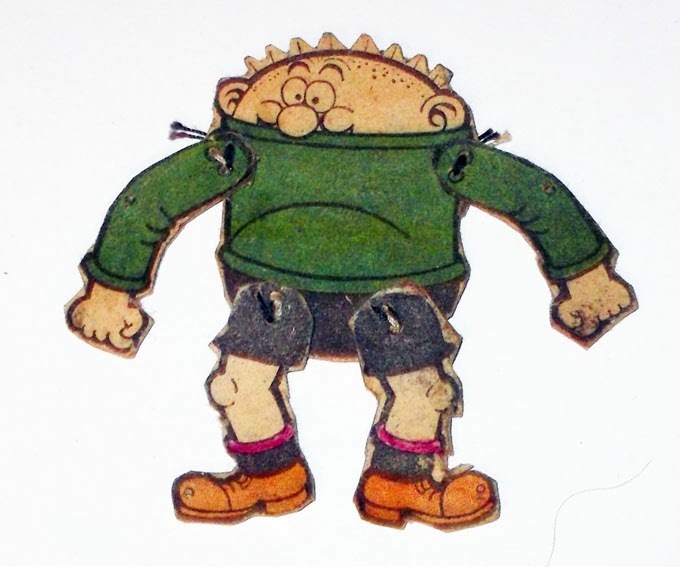 Rummaging through the comics on the UK Print Archive website, The Bash Street Kids puppets were reprinted in early issues of the Fun-Size Beano, along with a new Dennis puppet. Ah yes, I remember that now. Thanks for the reminder, Random!